Today’s is the final post of the first six months of Better Endings topics. Beginning tomorrow (Monday), I will post one month of The Best of Better Endings. Then this blog will shift its focus to being entirely centered around the approach of Life Mapping that I have developed over the past twelve years and am preparing to publish in a personal development book/handbook set for the general public, called Life Paths. I am in the late stages of completing a full edit of that book manuscript, which I will be sharing with my literary agent in late June or early July. I want to focus all of my attention on delivering an excellent manuscript and companion Handbook (and a revised proposal for publishers) by that time, so one month of the Best of Better Endings here and then a full shift to converting this blog to offer Life Mapping concepts and self-help tools and interactive discussion will be helpful and exciting, hopefully, for everyone! 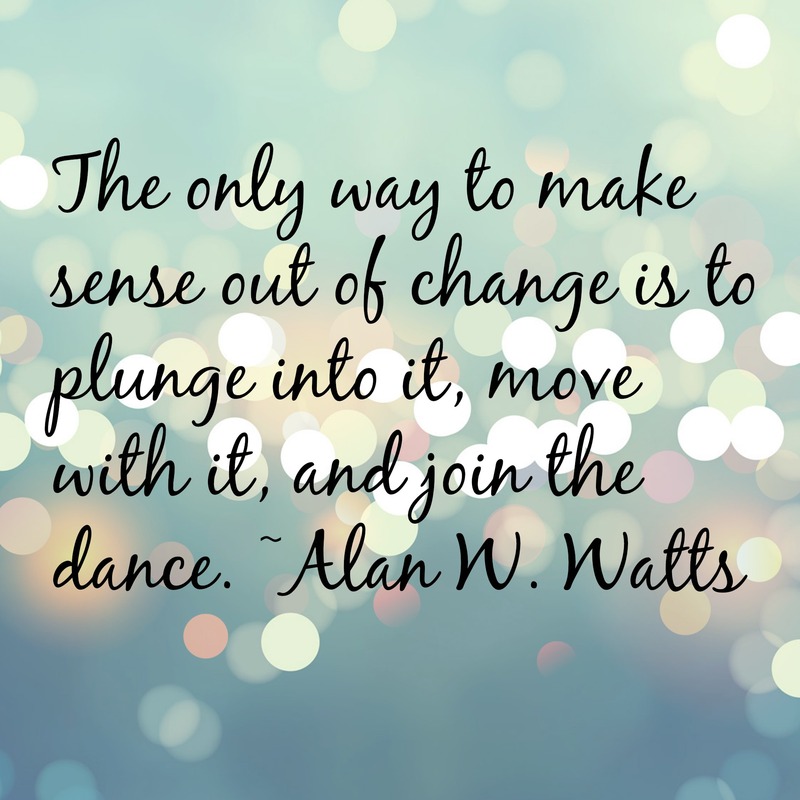 As a segue today, I’d like to share a story about a woman whose engagement with Life Mapping led to her own Better Endings as today she is living her Dream in ways she could not have anticipated before engaging in her life mapping adventure. Marnie (pseudonym) lost her spouse to cancer after an idyllic marriage of some 15 years. She sought out life mapping hoping to regain a positive outlook on life, which felt to her as if she had little to look forward to from the point of her loss forward. 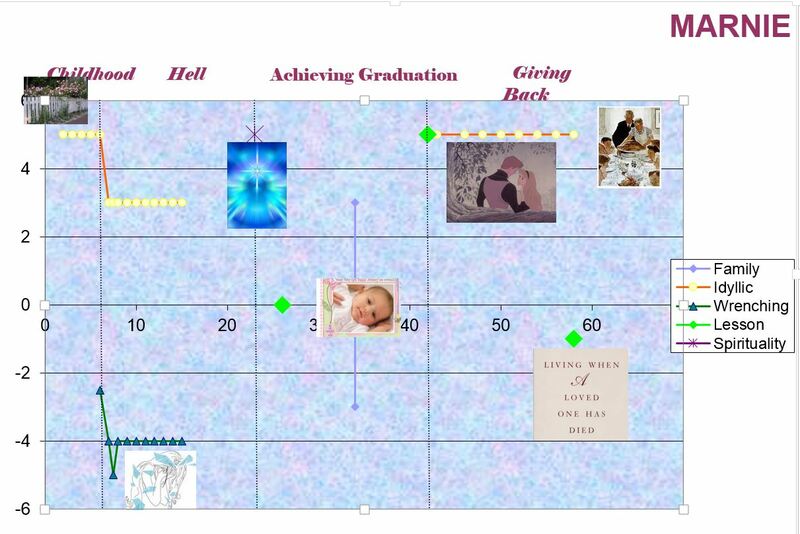 The Life Map above shows Marnie’s primary Life Themes, Critical Life Events, and Life Chapters, including a future envisioning image at the upper right. Marnie’s Life Story traces a dramatic, epic narrative from the depths of a personal Hell and back again, to an ultimate fulfillment of “Achieving Graduation” and “Giving Back”. Marnie suffered much abuse as a child in a dysfunctional family. As an adult she sought out and discovered a meaningful spiritual path, which lifted her in consciousness to go forward. Then a difficult marriage led her to a major lesson that culminated with divorce for the sake of ensuring her own daughter would have a better life growing up than had Marnie herself. This life changing decision eventually allowed Marnie to establish an Idyllic (her term) marriage with the spouse of her dreams, and she experienced several years of happiness until her spouse succumbed to cancer. In her Life Mapping process, after Marnie had reconstructed and reviewed some obvious patterns and themes that had formed the basis of her Life Story til then, I asked her to envision a Life Dream. Having closer Family-like ties and Freedom in the grandest sense were the two Core Values Marnie established as the focus for her revitalized Dream. She envisioned a family-like community of friends and somehow freeing time from her busy work life to be able to deepen her spiritual pursuits. Within a year or so from setting her Vision, Marnie learned that where she had worked for over 20 years in Arizona, most people were going to be laid off due to a budget crunch. She saw a notice not ‘meant’ for her eyes that let her know she would eventually be among those being laid off. But when she probed further, she realized that with the severance pay and then unemployment insurance she would be eligible to collect, that would put her to the age at which she could comfortably collect her pension and social security income. She would be both financially okay and Free! Around the very same time, her daughter, preparing to deliver Marnie’s 1st grandchild, moved with her husband to within a mile or so of Marnie’s home. Now Marnie would be able to enjoy a much closer family relationship and she would have a vital role in her grandson’s growing up. Upon “graduating” from her work when she was laid off, Marnie was also able to increase the hours per week she volunteered for the local sheriff’s office, offering grief counseling for people recently bereaved. And she accepted an important leadership role with her spiritual group that allowed her to place greater emphasis on her spiritual values and practice daily. Marnie’s is not an isolated story. 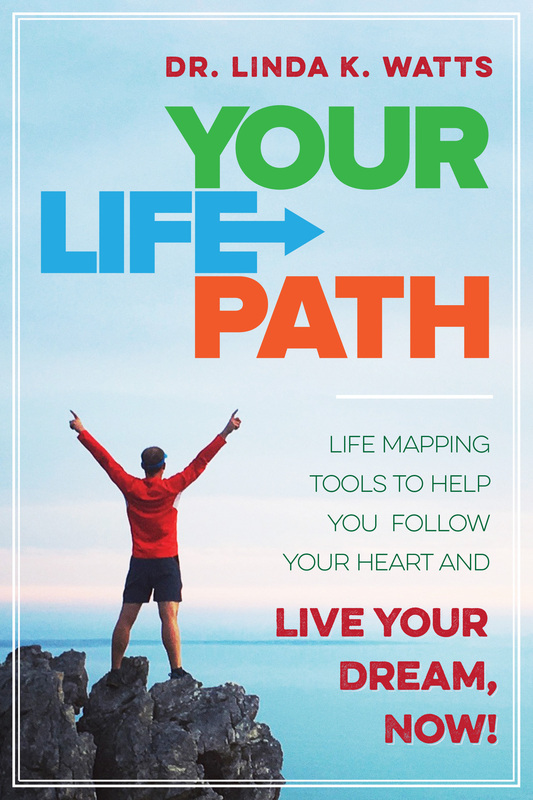 Life mapping in a process-oriented framework allows people to review their past, understand where they are at from the Threshold of the Present Moment, and Cross the Threshold via which they can consciously envision and then Live their Dream, Now! I look forward to sharing more of this with you as time goes on. Better Endings began as the title of the final chapter in Life Paths, so it’s fitting that this Better Endings blog has allowed me to first introduce at least the nub of this approach. Envision your Dream, and you can live it! Starting May 26 (the day after my Mother’s birthday), I will launch the second six months of this blogging adventure. Until then (except for introductions of the Best of Better Endings posts and replies to any of your always welcome comments and insights over this next 30 days), Better Endings to you! Thank You to everyone who has been reading this blog, and especially to those of you who have encouraged me to continue with this by “liking” some of these posts! It is for you and because of people like you that I feel called to continue, daily. Many of you have your own amazing, artistic and often poetic and useful blog sites and Twitter platforms of your own that I enjoy reading for their many insights and depth of perception and beauty. I feel humbled to have found this alti-verse of online expression which is so full of passionate insight and heartfelt honesty! When I was a youngster my sister Lee and I shared a bedroom for awhile. We would always have so much to talk about that our Mom would have to come to our room multiple times per night to encourage us to stop talking and go to sleep. We would try. But invariably after a minute or so had passed, one or the other of us would pipe up and say, “Important!” Then our conversation would start up all over again. After blogging a post every day for 178 days, I imagine it may be difficult this next month to “only” re-blog “Best of Better Endings” posts. I imagine I will pipe in now and again to say, “Important”; and, you can too! Thank you for the mention! We have a great deal in common as we do similar work. I wish you the best in your endeavors. Blessings to you! Thanks and yes, I see the kindred mission. Let’s keep in contact as the river moves us all along! Indeed, let us do so. Peace and Blessings!